Dat's a spicy meat-a-ball!!! lol Sorry couldn't help myself. I love a good meatball but never order them unless I'm dining at a proper Italian restaurant. Its kind of a crap shoot as to weather they are moist enough or taste good, especially if they dont have breadcrumbs in them; but this meatball recipe would make any Italian grandmother/mother proud! These meatballs when done right come out so juicy and great with tomato sauce or in a soup or even just by themselves. If you have leftovers you can even chop one up later and put the meat in your breakfast omelet. Meatballs are obviously high in protein so it can be a really healthy dinner option especially if your restricted by a gluten intolerance. Buon Appetito! Put all the ingredients for the meatballs in a large bowl. Mix the ingredients together with your hands. Once mixed start to form the meatballs about the size of your palm - try not to squeeze them together to tight, you dont want them to be dense. Once meatballs are formed place them on the oiled tray. Keep going until all the ingredients in the bowl are gone. Once done you can remove them and store them for later use or continue with the final steps. In a frying pan add olive oil and a bit of the fat drippings from the roasting pan, brown the meatballs at medium heat to get a nice outer sear. Once browned on all sides reduce heat to low and add in your tomato sauce, fresh basil and salt and pepper to taste. As the sauce warms coat the meatball in the sauce until the sauce is warmed through. You can move the meatball into a serving bowl, drizzle the sauce from the pan on top and add more freshly grated Parmesan if you want. 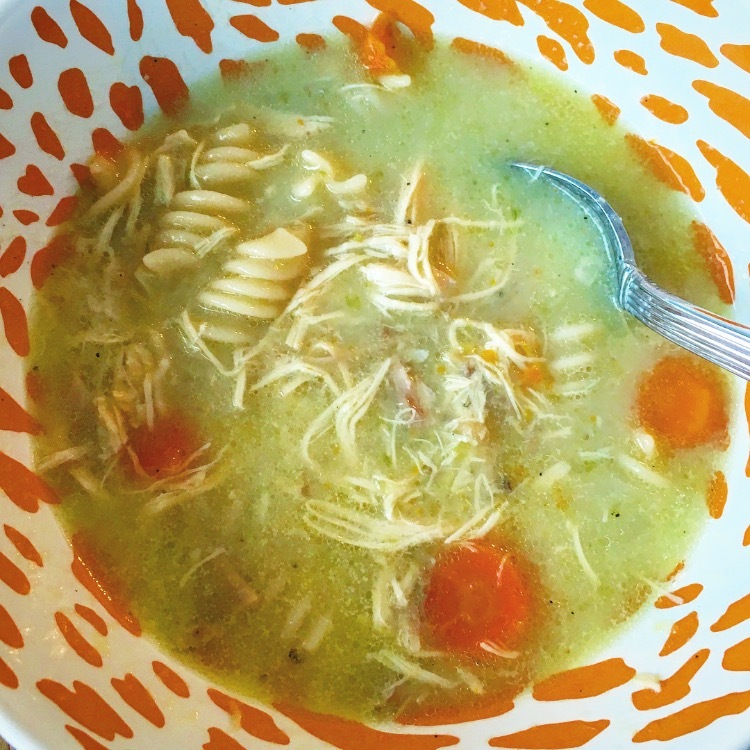 BABA's MACEDONIAN CHICKEN NOODLE SOUP - GLUTEN FREE! In a medium bowl, mix 2 egg yokes, the juice of 1 lemon and a bit of cold water. Give it a good wisk for 2-3 minutes. Add noodles to pot. As they are cooking, slowly add about 4-5 ladels of stock to the egg mixture, stirring as you do it. This will bring the egg mixture up to temperature of the stock and will make sure the yokes dont cook. 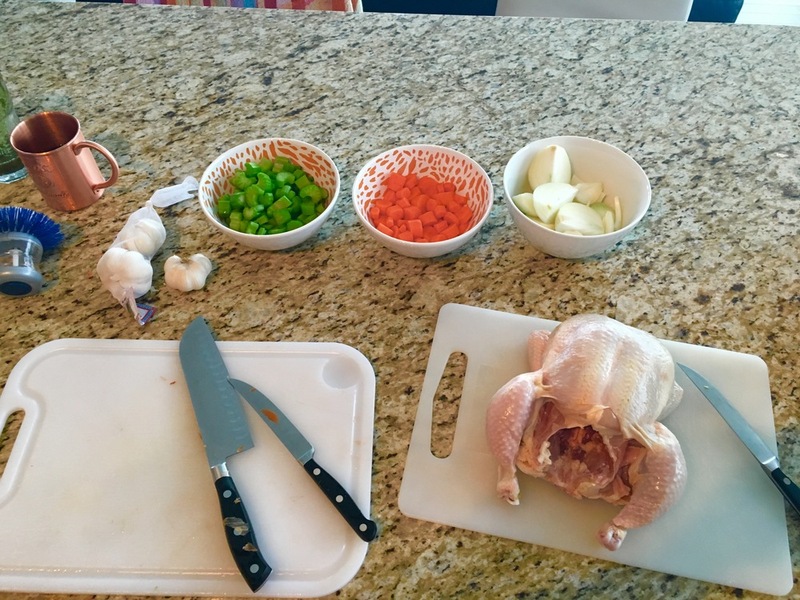 Remove from heat and cover to hang out for a few minutes or serve right away. When serving, a squeeze of fresh lemon juice and some fresh cracked pepper make it perfect! I ♥ Avocado toast! I seriously could eat it everyday. I was doing a plant based diet in the summer and this was one of my go-to breakfast options. Avocado is rich in oils and fat that your body needs on a daily basis. Yes avocado is full of fat but its good fat that keeps your hair shiny, healthy and stops it from falling out and your nails strong - believe me there are worst things I can eat. You can obviously eat this on toast as it is just as easy to make but I like to use rice crackers for their gluten free properties. I used to use gluten free bread and tried a bunch of different kinds but I like this better. Also its super easy to make when your in a rush in the morning. 1/4 - 1/2 a lime (juice) I like lots of lime juice! 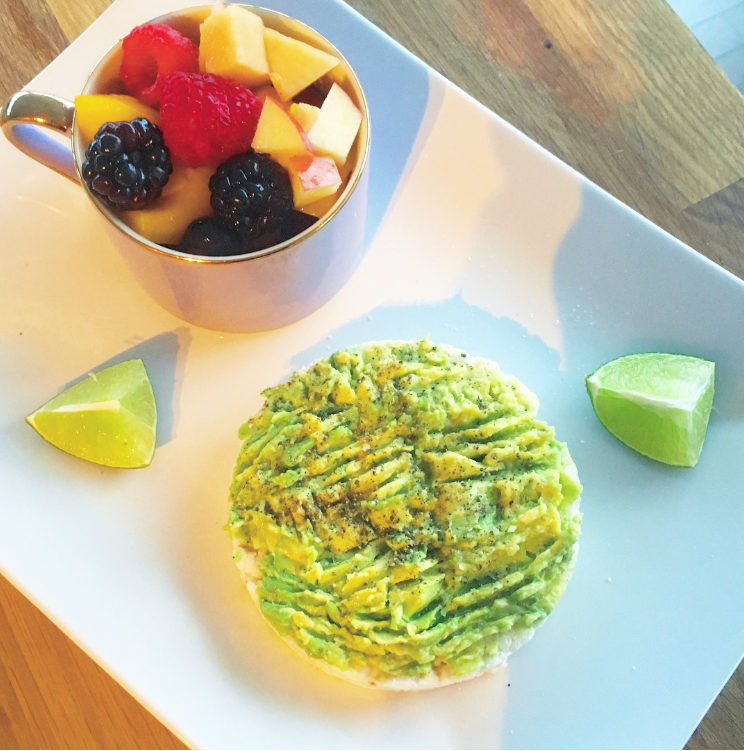 Mash and spread the avocado onto your rice cracker. Sprinkle Lime on top and serve. *You should serve it or eat it right away because the rice cracker will absorb all the moisture and start to get soggy. I like making fruit salad and keeping it in the fridge. Sometimes its hard to eat all the fruit you buy and this is a great way to get you reaching for them as a snack instead of chips or chocolate. I also find that if you take the prep out of it and all the fruit is already washed and cut kids/tennagers will eat more for it too. I also like to use it as topping on some granola and yogurt in the morning or even on pancakes as a substitute for syrup. It may seem like a pretty easy idea but some people add orange juice and liqueur but I dont think that's needed. Open canned peaches and pour out the syrup into a large bowl - this will be your base. Cut the peaches that remain in the can into smaller pieces. Wash the berries and add them to the cut up peaches and syrup. Cut up cantaloupe into small pieces as well as apple. Add it to the bowl - mix and serve.